We are South Carolina's specialist in real estate licensing, with comprehensive advanced training in: real estate, property management, appraisal, home building, home inspection and continuing education. We offer morning, evening and weekend classes to provide the best exam preparation available. Pass the first time. Period. Through the use of progressive teaching methods, our instructors utilize the latest technology to help thousands of students learn how to be successful in the real estate industry. As one of the oldest, largest and most professional real estate education providers in the state, we have more courses, more students, more locations and the most flexible schedule available. Don't be fooled by imitators. We have the tools to assist you, whether you're a new agent or a seasoned professional. From printed study aids on math and vocabulary, to CD's and www.PassTheRealEstateExam.com, the Real Estate School of South Carolina is your best source for beginning and maintaining your successful career in real estate. We know real estate - let us teach you. All of the practice exams on this site are created and/or reviewed by our owner and primary instructor, Charles H. Chip Browne, III. No one has successfully prepared more real estate students than Chip Browne! He began teaching in 1982 with his father, the late Charles H. Charlie Browne. 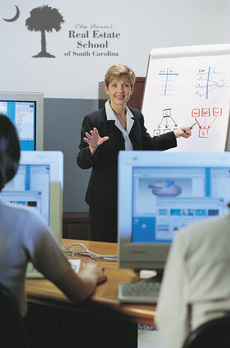 Chip maintains a reputation as an extremely thorough educator who possesses the rare ability to communicate effectively with beginning students, as well as seasoned professionals. A Clemson University graduate, his post-graduate work includes constitutional law and political science. He has taught throughout South Carolina and abroad. Chip is the author of South Carolina Real Estate Principles and is a reviewer of the upcoming Ethics in Today's Real Estate World. Visit our primary website at http://www.realestateschoolofsc.com!